TOLUCA LAKE, CA – One of Los Angeles’ most iconic properties, the 5.21-acre Bob and Dolores Hope Estate in Toluca Lake, has been sold by Craig Strong, executive director of the Estates Division at Pacific Union International. 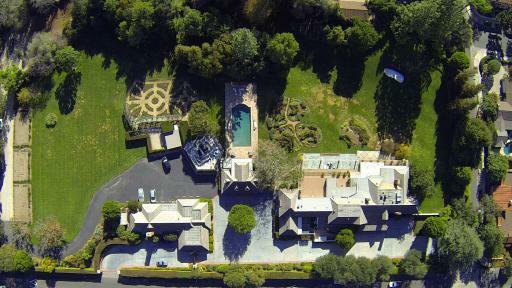 Strong, who was recently named to Variety magazine’s Los Angeles Showbiz Real Estate Elite and has been recognized by The Wall Street Journal year after year for closing more than $100 million in sales annually, negotiated the sale of the landmark property to businessman Ron Burkle. In keeping with Dolores Hope's Will, all proceeds from the sale will go to the Bob & Dolores Hope Foundation, a notable charity founded by the Hope family. Known as Mr. Toluca Lake for his tireless involvements in community activities and his insider knowledge of the area, Strong first listed the Bob and Dolores Estate in 2016 and worked diligently alongside Hope’s daughter Linda to find the right buyer for this significant property, which served as the home and estate of one of America’s most celebrated entertainers. Several serious offers from developers that were considerably higher than the sale price were turned down over the years, as it was important for both Strong and Hope’s family that the ultimate buyer was interested in preserving the main Hope residence and committed to reducing potential future development on the rest of the property. The centerpiece of the property is the English traditional-style main residence that was originally built in 1939 by architect Richard Finkelhor, who also designed estates for Barbara Stanwyck and Harpo Marx. In the 1950s, famed Hollywood architect John Elgin Woolf — the go-to designer for Cary Grant, Errol Flynn, and Katharine Hepburn, among other Hollywood royalty — expanded the property to host a nearly 15,000-square-foot home. The main residence is accompanied by a two-bedroom guesthouse and separate staff quarters and offices. Beyond the home’s grand interior lies an outdoor swimming pool; a one-hole, three-par golf course and putting green; an array of outdoor spaces on both levels affording stunning views of the lush gardens and lawns; a formal rose garden; and a large guest house. An indoor/outdoor swimming pool and spa also sit adjacent to the guest house. Craig Strong is the executive director of the Pacific Union International Estates Division. He works with both buyers and sellers in the greater Los Angeles area. For more information, please call (818) 987-9700, or visit http://www.strongrealtor.com. In addition to his professional accomplishments, Craig’s civic participation in Toluca Lake and Studio City, in addition to his fundraising for Children's Hospital Los Angeles, demonstrates his desire to give something back to a thriving community. He understands the issues that impact local citizens and is helping to address and solve them. Craig lives in Toluca Lake with his wife Tara, an in-demand voiceover actor who can be heard on numerous children’s animated series such as Rugrats, Powerpuff Girls, Fairly Odd Parents, My Little Pony, Ben-10, and the soon-to-hit theaters Teen Titans Go!, just to name a few. Together, Craig and Tara are raising two sons—their “pride and joy.” For more information, visit: http://www.strongrealtor.com. Founded in San Francisco in 1975, Pacific Union International, Inc. is the West Coast’s premier luxury real estate brand, with 2017 sales volume of $14.1 billion. In 2018, real estate industry leaders RISMedia and REAL Trends ranked Pacific Union as the fifth-largest brokerage in the U.S. Through its 2015 acquisition of The Mark Company, the nation’s leading sales and marketing firm for new urban luxury developments, Pacific Union expanded its brand to development projects from San Diego to Seattle. In 2016, Pacific Union merged with Los Angeles-based brokerage John Aaroe Group, followed in 2017 with mergers with Partners Trust and Gibson International also based in Los Angeles, and Empire Realty Associates, extending the Pacific Union brand to become the preeminent leader and ultimate California real estate company. The strategic alliance of these five powerhouses supports 1,700 elite real estate professionals in more than 50 offices throughout the West Coast. Northern California markets include San Francisco, Marin, Contra Costa, Alameda, Napa, and Sonoma counties; Silicon Valley; and the Lake Tahoe region. Greater Los Angeles markets include Beverly Hills, Malibu, Downtown, Northeast L.A., the Westside, as well as the San Fernando and San Gabriel Valleys. To extend Pacific Union’s international reach, the brokerage established an award-winning, Beijing-based China Concierge program in 2013 that fully supports its Chinese investors on the mainland. Additionally, Pacific Union offers a full range of personal and commercial real estate services, including buying, selling and relocation, in addition to operating joint-venture businesses that provide rental and commercial property management and insurance services. Locally owned, Pacific Union executes with a vision for the future, an entrepreneurial mindset and an unwavering commitment to deliver exceptional service and expertise. For more information, visit: www.pacificunion.com.